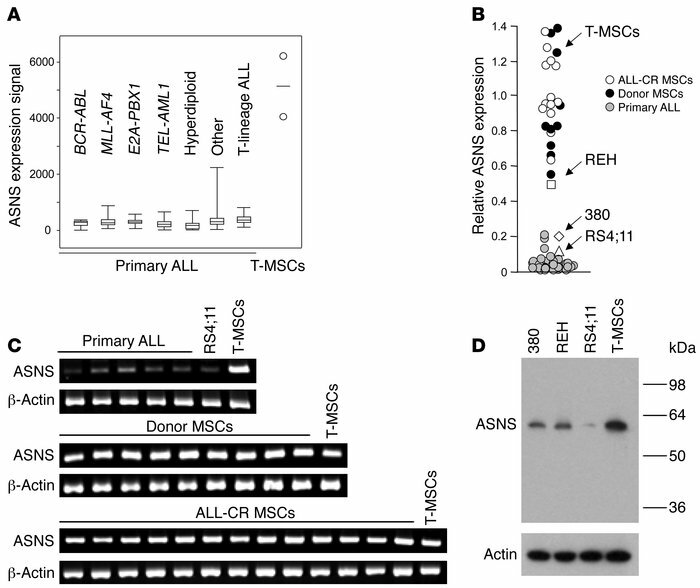 Expression of ASNS in ALL cells and bone marrow–derived MSCs. (A) Expression of ASNS mRNA in 288 samples of primary ALL cells compared with that of TERT-immortalized MSCs (T-MSCs; mean of 2 measurements denoted by circles) by Affymetrix GeneChip arrays. Boxes denote interquartile range; whiskers denote range; lines denote median. *Cases lacking known genetic abnormalities. (B) Expression of ASNS mRNA in ALL cell lines, primary ALL samples and primary MSCs as measured by real-time RT-PCR. Primary MSCs were obtained from the bone marrow of 9 healthy donors (Donor MSCs) and 13 patients with ALL undergoing therapy and in complete remission (ALL-CR MSCs). Shown is ASNS expression relative to that of the TBP gene. (C) ASNS mRNA expression in primary ALL cell samples, the RS4;11 ALL cell line, and primary MSCs by semiquantitative RT-PCR; signals obtained with TERT-immortalized MSCs are also shown. β-Actin was used as a control. (D) Western blot analysis of ASNS protein expression in ALL cell lines and TERT-immortalized MSCs. After probing with the anti-ASNS antibody, the membrane was stripped and reprobed with an anti-actin antibody.